A FORMER bank manager who allegedly conned millions of euros from the residents of a mountain town has been arrested at his Caribbean hideaway. Antonio Herrero, who owned a ham company in Trevelez near Granada, was detained by Interpol officers in the Dominican Republic. 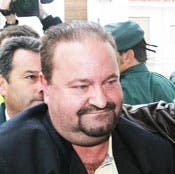 Police believe Herrero, 50, used his position as director of the CajaGranada bank in Trevelez to scam 25 million euros from his victims. Telling them they would see handsome returns, he duped 300 residents of the Granada town into investing money – in many cases entire life savings – into his failing ham business. Instead he absconded from Spain, spending the money on his lavish lifestyle first in Panama and then the Dominican Republic, where he was arrested on December 12. During the four-hour hearing, he said his company first got into financial difficulties in 2000 before he started asking Trevelez residents to invest in Jamones Fernando SL. The father-of-two, also known as El Jamonero, promised investors they would see a 25 per cent return on their money. Instead they we left in financial ruin as Herrero flew to Central America. There and in the Dominican Republic, he earned his living by acting as intermediary in the purchase and sale of real estate. He added that he enjoyed an “upper-middle class lifestyle” during his self-imposed exile. Herrero, who is believed to owe a further 45 million euros in unpaid bills and taxes, did not apply for bail. Instead, his lawyer told the court in Órgiva that his client feared retribution from those from whom he had stolen money. He was placed on remand in Albolote prison in Granada on charges of fraud and tax evasion. In an interview with a local newspaper in 2005, Herrero claimed he fled as he owed money to Russian mafias.